This is the time of year that we start thinking not only about winter and fall comfort food, but also about making sure that others in our community have something warm and wholesome in their bellies. Food banks across the country are about to kick into food-dive mode and thankfully, many of us are feeling more generous with our cash donations and canned goods as we get closer to the holidays. Last week we tried the Pasta Puttanesca (pictured above) at Provision and it was absolutely delicious. Best of all, part of the proceeds from sales of these special OctoberFeast items go towards putting together hampers at the Calgary Food Bank. And it also got us thinking… how many Best of Bridge recipes make use of these most needed Food Bank items? The original ladies prided themselves on creating recipes with practical easy-to-find ingredients, so there really are quite a few. You’ll find cereal in our classic Christmas Morning Wife Saver and canned soup in our Classy Chicken. And don’t forget one of our all-time most popular recipes, Hamburger Soup. 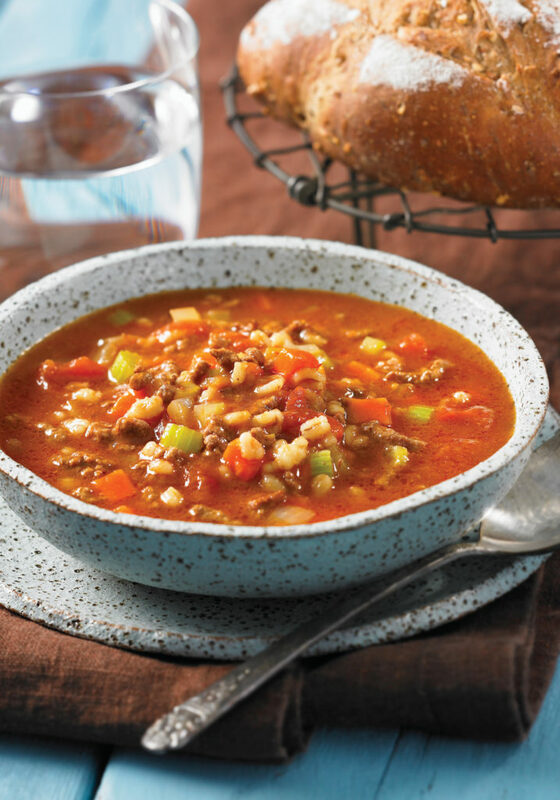 This slow-cooker version of Hamburger Soup appears in our Family Slow Cooker book. We took out some of the canned soup, but replaced it with tomato sauce, so it still fits the bill. Posted in Slow Cooker, Soups, Salads & Dressings.